As we reported briefly yesterday, the U.S. Department of Labor has withdrawn guidance issued during the Obama Administration related to independent contractors and joint employment. Both documents were in the form of so-called “Administrator’s Interpretations,” which was a form of guidance the Obama DOL adopted in 2010 when it ended the longstanding practice of issuing Opinion Letters. Properly classifying a worker is critically important. If an employee is misclassified as an “independent contractor,” the employer can be liable for back wages, including overtime and liquidated damages, under the Fair Labor Standards Act; back taxes and penalties for failure to withhold income, Social Security, and Medicare taxes or pay the employer’s share of Social Security and Medicare taxes; as well as other benefits that are offered to employees, such as stock options, profit-sharing, retirement, health and life insurance, and even severance if the relationship ends. The joint employment guidance was issued on January 20, 2016, and applied to “joint employer” relationships under the FLSA and the Migrant and Seasonal Agricultural Worker Protection Act. As with the independent contractor guidance, the Obama Administration took an expansive view, finding that there could be a “horizontal” joint employer relationship (workers who perform work for two related companies, for example, or for two unrelated companies that have an employee-sharing arrangement), as well as a “vertical” joint employer relationship (for example, when a staffing company supplies workers to a client, or workers are employed by a subcontractor who performs work for a general contractor). If a horizontal joint employer relationship exists, then the employee’s work hours for both employers must be aggregated, meaning that the employee is more likely to be entitled to overtime. (And both employers would be jointly and severally liable for failure to pay overtime.) Similarly, in a vertical joint employer relationship, both employers would be liable for any violations of the FLSA (or the MSWPA). Although the Obama-era guidance was expansive, it was not inconsistent with positions taken by some courts ruling on these issues. Thus, employers should continue to be very careful about classifying workers as “independent contractors” or taking untenable positions in “joint employer” situations. Moreover, the Trump DOL merely withdrew the Obama-era guidance but has not issued “replacement” guidance. Presumably, new guidance will be forthcoming and will be more employer-friendly, but we would not anticipate dramatic changes to existing law. Indeed, the withdrawal of the two guidance documents could mean nothing more than that the Trump DOL may return to the use of Opinion Letters instead of Administrator’s Interpretations. Opinion Letters are generally issued in response to specific inquiries by employers or their representatives, or by unions. 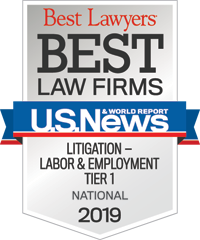 Although they are publicly available (and can be used in litigation), they are fact-specific and usually limited to the questions asked by the employer. As noted, the Obama DOL ended the practice of issuing Opinion Letters responsive to inquiries and instead used Administrator’s Interpretations. In so doing, the DOL chose the subjects on which it wished to opine. Ironically, the Obama DOL issued only seven such Administrator’s Interpretations over the years, two of which have now been withdrawn.